Avant-garde flyer design promoting a new dance show for VooDoo Entertainment. Visually compelling flyer design promoting the “Stardust” dance show by VooDoo Entertainment. Report Design Sample. 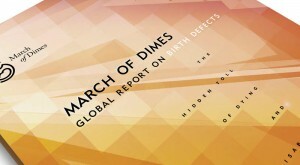 2006 March of Dimes Global Report on Birth Defects. International report documenting the global toll of birth defects in 193 countries.